Hyperphosphatemia is defined as serum [Pi] > 4.5 mg/dL. 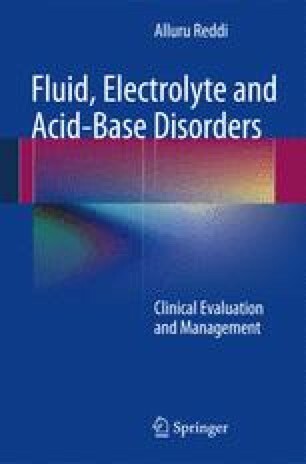 Spurious increase in serum [Pi] is called pseudohyperphosphatemia . It is rather rare but has been described in conditions of hyperglobulinemia, hypertriglyceridemia, and hyperbilirubinemia. This spurious increase has been attributed to the interference of proteins and triglycerides in the colorimetric assay of phosphate. The causes of true hyperphosphatemia can be grouped under three major categories: (1) addition of phosphate from the intracellular fluid (ICF) to extracellular fluid (ECF) compartment; (2) a decrease in renal excretion of phosphate; and (3) drugs. In clinical practice, acute and chronic kidney diseases are probably the most significant causes of hyperphosphatemia.